This page/ section focuses on my environmental engagements. IUCN: In March 2016 I was selected as member of the IUCN CSVPA Steering Group (initially until the WPA conference later that year, now renewed) this complements the webmaster work I’ve been doing for the CSVPA since March 2014. In May – June ’16, I facilitated online discussion of two motions ahead of the IUCN’s World Conservation Congress in Hawaii in September ’16. In July ’16 attended the ‘Expert workshop on the Recognition and Promotion of the Cultural and Spiritual Significance of Nature in the Management and Governance of Protected Areas, specifically World Heritage Sites‘ hosted by the German Federal Agency for Nature Conservation (BfN) and organised by IUCN-CSVPA. I’ve also for IUCN researched and reviewed a number of nature-related World Heritage applications (as the process is confidential I cannot mention which ones). In May 2018 I was invited to speak at the IUCN UK 70th anniversary event on sharing common goals. Islamic Reporting Initiative (IRI): since June ’16 I’m part of the Advisory Council, after being a member since 2015. Working on matching SDGs to Islamic principles and draft IRI/ SDG guidelines. Permaculture International Research Network (PIRN): member, e.g. compiled info on ten key permaculture publications. Currently working on faith and permaculture summary and on steering group of some sub-groups. GreenData: I was an early participant in the OU KMI’s GreenData project, a new project to capture, store and share power generation and use data from domestic renewable energy installations, including solar, wind and solar/ geo thermal sources for ‘real time’ use by students. Left it when I sold my house from which the project was getting data. Facilitation & tutoring I (co-)facilitated the OU’s Ecosystems MOOC on FutureLearn (from first FL course, to presentation in October ’16); I tutored on the OU’s U116 (Environment: Journeys through a changing world) from its launch in 2009 until early 2018. I was a Community Faith leader in MOOC on wicked environmental problems on global environmental education. In June ’16 was given an Expert Certificate for my participation in the course. In September – October ’16 I was a community leader on ‘Reclaiming Broken Places: Introduction to Civic Ecology‘ (EdX MOOC). In 2015 I facilitated the IFEES’ Charter Team to get to an Islamic Declaration on Climate Change. Talks: speaker on Islam and environment (peace with ourselves, peace with out surroundings): Centre for Trust, Peace and Social Relations (CTPSR) at Coventry University which co-hosted a conference with the Muslims in Britain Research Network (MBRN) to explore the role religion can play in achieving more peaceful and just societies. In June ’18 spoke on faith & environment at the Earth Trusteeship Gathering in The Hague (NL), leading to The Hague Principles. Radio: in the UK for a year I had a weekly ‘HomePlanet’ environment show on community radio (in English); since February 2018 I have a similar show on regional public radio in The Netherlands (RTV1, in Dutch). I’ve e.g. been quoted in The Guardian and EMEL on faith and environment; in 2013 shared a platform with Satish Kumar at Malvern Faith & Science weekend; in 2010 was panellist at Radical Middle Way event on Islam & the environment and participated in Cardiff University research into Islam & environment. In ’16 I spoke at COP22 for the IRI. 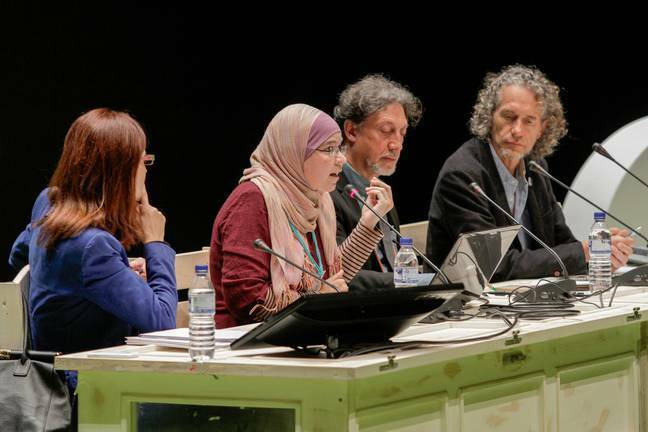 In May 2017 I spoke (in Spanish) in Huelva (Spain) on faith, education & environment (media coverage) and in August ’17 at Greenbelt (The Grove, on a panel on Abrahamic faiths and Creation care for common good). In ’11 spoke for an Indonesian audience at Birmingham University. Since early 2018 I am a Happy Planet Professional. Member (and signatory of statement on ecocentrism) of the Ecocentric Alliance, which is a global network that advocates for ecocentric thinking.